Brisket is a favorite in the Southern regions of the United States. Places like Texas like to place claim that they are the originators and masters at preparing brisket the best. This cut of beef is enjoyed in all areas of the world. But, to get an authentic taste of what brisket should taste like, you might want to settle in south of the Mason Dixo line. Here is how you can cook brisket for your family and friends. This is sure to be a crowd favorite. 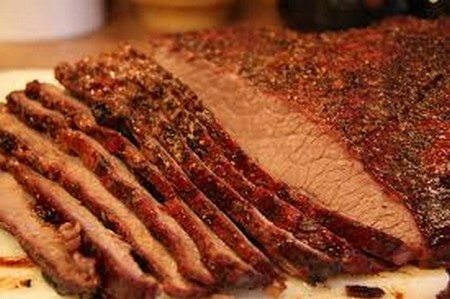 Read on for the recipe and instructions on how to cook brisket-Texas Style. Buy a cut of beef brisket. When the brisket is on the shelf, try bending it back. You want it to bend easily. If it does not bend, then try finding one that will. This is an indication of how fresh the meat is. Do this step a day in advance. Take the beef brisket out of the market packaging. Rinse it thoroughly under cold water. Now pour the Italian dressing over the meat. Use the whole bottle. Wrap it in aluminum foil and put the entire brisket into your large foil baking pan. Put the brisket in the refrigerator for at least four to six hours. Overnight is always better. Create your rub for the brisket. Blend 1 tablespoon red pepper, 1 tablespoon black pepper 1 tablespoon garlic powder, 1 tablespoon onion powder and 1 teaspoon of celery salt and table salt in a small dish. Rub the beef brisket with the rub you just made. Season it very liberally. The more seasoning the tastier the brisket! Cover the entire surface of the beef brisket. Turn the brisket over and add more rub. Assemble the smoker using the manufacturer’s directions. Cook the beef brisket slowly for about twelve to sixteen hours. Check on the progress every couple of hours. Add more wood chips when they cease to smoke. This evens out the flavors. You don’t want to allow the wood chips to dry out and you miss the right time to replace them. It will affect the end result in terms of flavor. After the beef brisket is cooked all the way, allow it to sit and cool. This allows the juices to redistribute in the meat. It keeps it from being dry. Cut it up and serve it with your favorite side dish. Potato salad is always a great option.